Batch CHM to Word Converter Chm to Word Document Batch Converter. Chm to Word Doc Converter batch extract and convert HTML help to Word document. Compiled HTML Help (CHM) files are frequently used in Windows applications. 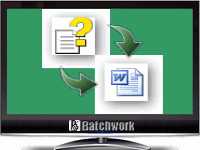 Batchwork's Batch CHM to Word Converter converts CHM files to Microsoft Word documents singly or in batches. To that end, it integrates a file-specific search feature; drag-and-drop functionality; and the ability to pause, save, and resume conversion jobs in project files using a proprietary format (.batch-chm2doc) in a single, simple interface. This is a compact tool that downloads, installs, and sets up quickly. The interface is intentionally simple and efficient, with an integrated file menu/toolbar, Source and Target fields, Search and Convert buttons, and main file display. The tool/menu bar includes a full Help file as well as icons for support and updates. Buttons labeled Folder, File, and View call up compact dialogs for browsing to directories; we used it to check our test system for CHM files. The software found hundreds, including the same files in many different languages. We created a target folder in a chosen directory and clicked Convert. Not only did the program quickly convert the large batch of files to Word docs, but it also preserved all the hierarchical folder structure within the target folder, which made it much easier to find specific files. The new Word documents opened normally, and all content appeared intact. Batch CHM to Word Converter is easy to learn and use, and it's quick and effective at what it does. You probably have more CHM files in your PC than you realize; this tool makes it easy to access them. It's definitely recommended. Editors' note: This is a review of the full version of Batch CHM to Word Converter 2010.2.506.1193. The trial version is limited to seven days trial only.